A teenage batsman has been backed to lead Oxfordshire to a Minor Counties Championship title against Cumberland. 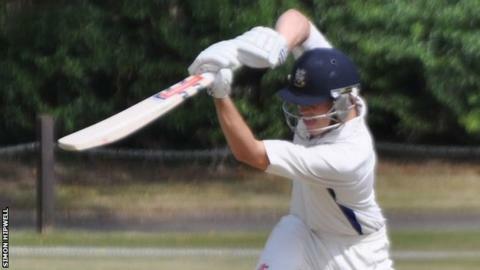 Schoolboy Harrison Ward became the youngest player to score a century in the competition earlier this season. Captain Luke Ryan is confident the 15-year-old will handle the occasion of the four-day final at Carlisle. "When Harrison's out there batting with his helmet and gear on, he doesn't look anything like a 15-year-old boy. He's very assured," he told BBC Sport. Left-hander Ward, who plays his club cricket for Horspath, made 109 not out on debut against Herefordshire in July and team-mate Ryan is not surprised by his success. "I'd played against him a couple of times in club cricket and was very impressed," he added. "He was like a duck to water when he went straight into the Oxfordshire side and was very unlucky to be dismissed cheaply in his first innings (for seven). "But, second innings he obviously scored a century and since then has made a couple of really significant scores and looked increasingly confident." Ward is not the only teenager in the Oxfordshire side. Harvey Eltham, 17, has taken 20 wickets in four championship matches with his off-spin. Both are expected to line up alongside Ryan as Oxfordshire contest their first final for 24 years from Sunday, against former Durham batsman Gary Pratt's Cumberland side. Both counties won five of their six division matches en-route to the final, with Oxfordshire winning five in a row.